Does All Work and No Play Make Marketers Dull? 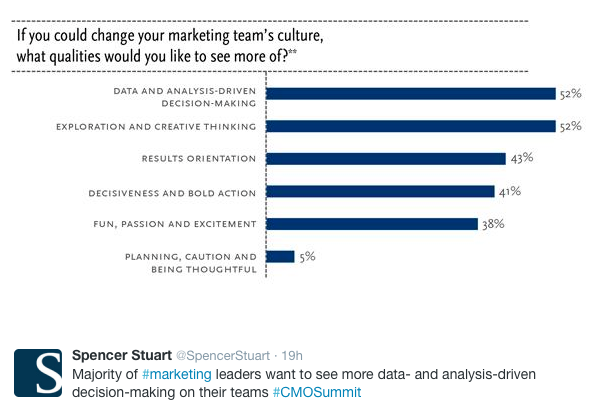 On the flip side, only 5 percent of marketing wants a culture of “Planning, Caution and Being Thoughtful.” Amen, brother. I hear you. If it was “fun,” they would call it “play” and not work. But maybe we need a little more play at work after all. According to Peter Gray, a professor at Boston College and author of Free to Learn, ”play” can be the key that unlocks the mindset of bold creative thinking. In an article on Psychology Today, Gray says that the “alert but unstressed condition” of a playful mind has been shown repeatedly, in psychological experiments, to be ideal for creativity and learning new skills. “Experiments have shown that strong pressure to perform well (which induces a non-playful state) improvesperformance on tasks that are mentally easy or habitual for the person, but worsens performance on tasks that require creativity, or conscious decision making, or the learning of new skills.” Although accountants may perform well under pressure, it could be a creativity killer for marketers. One could conclude then, if an organization too narrowly focuses on “analysis and data driven decision making,” it may come at the expense of “Exploration and Creative Thinking” mentioned in the research and tweet. Said differently, all work and no play could make your marketers dull.